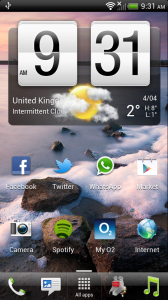 Ice Cream Sandwich on the HTC Sensation/XE – my thoughts (review) | GEEK! Ok, so I’ve only had ICS on my phone for around a day – so it’s hardly the time to be too judgmental about it, but I thought while I have half an hour spare I’d share my thoughts so-far. Overall, I love it – it is so much faster than Gingerbread was. It really is like getting a brand new phone six months after buying it. The interface is faster than ever, memory management is decent, apps load quickly and power consumption isn’t too bad either. The actual interface design hasn’t actually changed hugely – you get a new homescreen, new menu and new settings interface – but most other things are reasonably similar. The lock screen has barely changed at all – but for the fact that notifications now show a contact image and you can use face unlock, it’s all the same. In terms of functionality, I’ve found a couple of minor niggles but otherwise it’s pretty decent. My first problem is that I’ve lost HTC’s autocorrect functionality on the keyboard in many third party apps such as Twitter – this is a nightmare and causes a lot of problems when writing half-hearted tweets. There are also a couple of spelling mistakes within the software – and whilst this really isn’t a problem it is something I’m very OCD about. This, for example. Somebody at HTC must have forgotten how to spell. Put the minor niggles aside and there’s nothing you won’t like about Ice Cream Sandwich. It’s always been a question to me whether the new update would mean better battery life, and whilst I haven’t had the chance to test that out many people are reporting much better standby time. I’ll see how it goes – I’m too much into the habit of leaving the phone on charge for half the day so I’ll need to creep out of that habit a bit. The update is available now for all unlocked, unbranded HTC Sensation and Sensation XE phones in the UK so grab yourself the download if you’re ready to upgrade. It’s around 300MB and you’ll need to do it OTA so make sure you’re connected to a wi-fi network if you haven’t got unlimited data. The upgrade took me around 20 minutes, but I ended up doing a factory reset after I’d upgraded. I sort-of wish I hadn’t really reset it – many people recommended that you do but after doing so I don’t think it’s actually made much of a difference. Other than the fact I’ve wasted hours of my life putting it all back together, it hasn’t really done me or the phone much good! Still, go get it if you’re phone can. You won’t regret it – just make sure you do a backup of your phone just incase anything goes wrong. This entry was posted in In the News, Mobile Devices, Software, Software reviews and tagged 4.0, android, cream, htc, ice, sandwich, sensation, sensation xe, Software, update, upgrade on April 4, 2012 by GEEK!.